Best Days: Most days: small mix of swells from the south (Tues/Wed), and east/north-east (mainly Wed/Thurs onwards), with an extended period of light variable winds. Recap: The weekend played out pretty much as expected: building SE windswell but horribly onshore on Saturday, with rapidly improving conditions on Sunday as a coastal trough moved to the south and winds slowly veered from the SE to the S, SW and then W. Wave heights managed 3-4ft through the high point of the weekend, and although eased a smidge through Sunday afternoon (as conditions became cleanest) there were super fun waves across most Southern NSW coasts. Conditions have remained favourable today though wave heights have eased since yesterday, with size mainly around 2ft+ at exposed beaches. A broad surface trough remains entrenched across the western Tasman Sea, and will move very slowly throughout the week. The core part of the trough responsible for the weekend’s SE swell is now well to our south. A small E’ly fetch redeveloping on its southern flank is mainly aimed into the Far South Coast, it will generate some small sideband energy for Sydney, Illawarra and perhaps Hunter coasts over the next few days but no major size is likely. A developing NE infeed into the broad trough will generate small levels of E/NE swell all week (from Wednesday onwards), and we’ll also see some long range (though ultimately moderate-period) E/NE swell from a lengthy E/NE fetch way out NE of New Zealand. 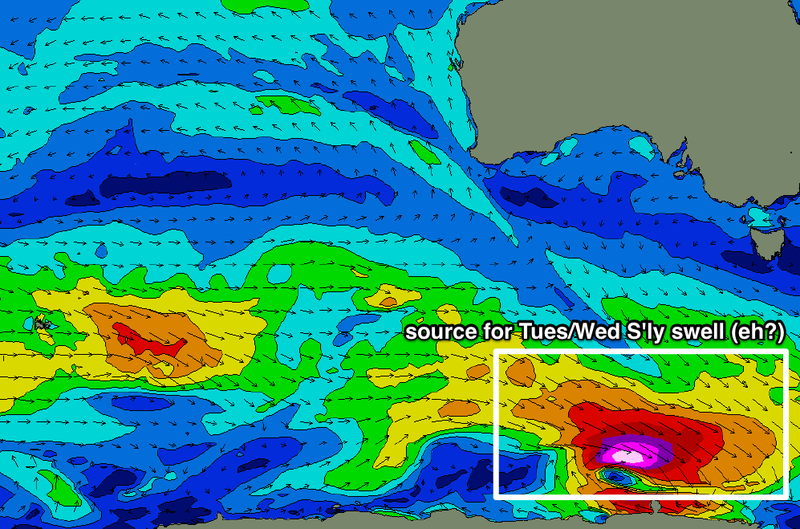 This will provide small surfable waves through the longer term period. 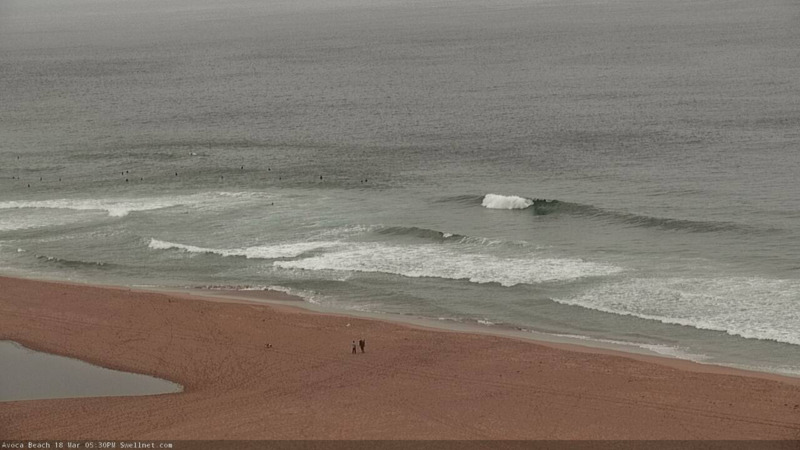 Don’t expect much more than a slow, inconsistent 2ft+ wave at exposed beaches from either region though. As for other swell sources, the models are showing a small long period S’ly swell across Southern NSW on Tuesday and Wednesday, around half a metre at about 14-15 seconds. This didn’t really stand out when Friday’s notes were being (rapidly) prepared, however I’ve quickly hindcast the model data and can see it’s sourced from a poorly aligned W/SW thru' NW fetch around an intense polar low well south of Adelaide on Friday morning (see chart below). As you can see, the fetch is aimed well and truly away from our coast, though when projected over the great circle parts for Southern NSW, it is marginally better aligned - but only just. What makes this system different is the way the storm track evolved, and where the intensification has occurred; right on the periphery of Sydney’s acute southerly swell window - any further west or east would have ruled it out as a potential sourc eof surf. It’s hard to imagine how we could possibly pick up a small S’ly swell from a NW fetch, but based on previous experience where these kinds of swells have slipped through the net, it’s quite plausible that we’ll see minor sideband S'ly energy glance the Southern NSW coast on Tuesday and Wednesday: this is one of the rare moment when I think the model has actually resolved a flukey swell source well (I think the 60-70kt core wind speeds probably have something to do with it too - the models can’t ignore it!). As such, most beaches will probably dip out form this source, but south swell magnets should see occasional 2ft, maybe 2-3ft waves over the coming days. Keep your expectations low and you may be pleasantly surprised. This S'ly swell will fade through Wednesday afternoon as the E/NE swells start to be a little more dominant. As for winds, we’ll see a weak pressure gradient adjacent the coast all week and thus an extended period of variable conditions. Of course, variable does mean there’s a chance for onshore winds, but it’s unlikely we’ll see any strength. No major change expected this weekend, from what we’re expecting on Thursday and Friday, which is, small, intermittent E/NE swells offering occasional 2ft+ sets. 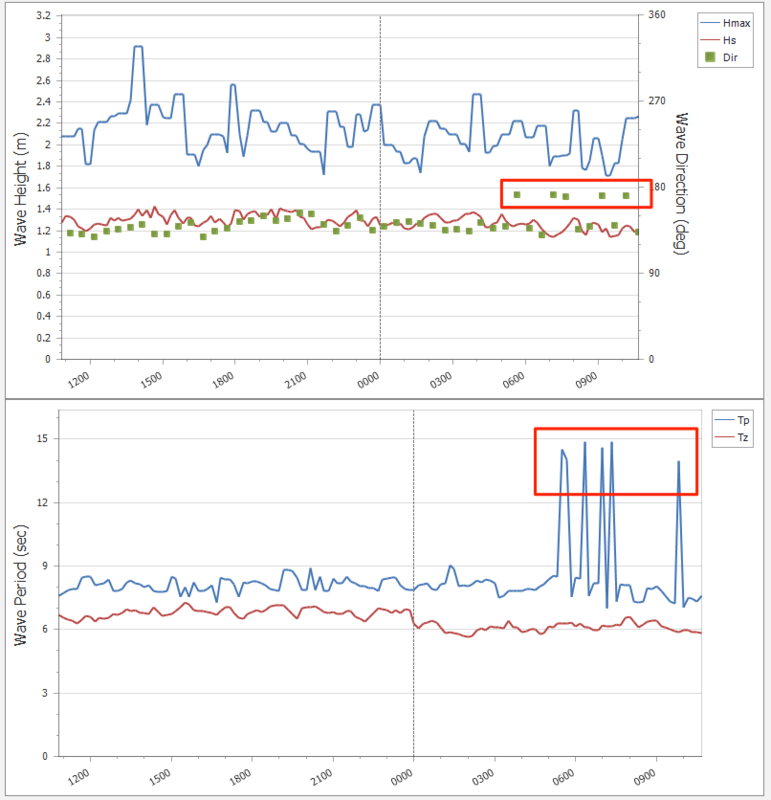 Winds should remain light and variable under the persistent troughy pattern. This week’s synoptic pattern is essentially a regional block, whereby there’s very little movement in the local weather systems from day to day and therefore no major change in local winds and weather either. This block is expected to break down over the weekend as a series of strong fronts approach the SE corner of the state. At this stage they’re expected to cross the Tasmanian divide around Tuesday or maybe Wednesday so we’re looking at a possible southerly swell mid-next week onwards. N’ly winds and thus N’ly windswells may precede this development. Otherwise the models are suggesting all kinds of dynamic tropical developments will slide south from the Fiji/New Caledonian region mid-late next week and comprehensively evolve in the Tasman Sea, generating large E’ly swell sometime around the first few days of April. This is still quite some time away, but is plausible given the broad unstable atmosphere expected across our broader Tasman swell window by this time. As such we’ve got quite a busy couple of weeks ahead in the surf department! Hey, great call on the winds switching Westerly on Sunday. I read it on the morning report and was ready to call BS seeing as every model I looked at (including Meteye) didn't support it. Then it happenned and the waves pumped! Sunday arvo after the wind switch was the best my local has been for a good long while. Not many people out either. Yep, it's been a while since I've seen it that good - plenty of people in the lineup my way but not too much of an issue when there's so many great waves coming through. Manly was looking sweet as on Sunday as very pro, semi pro and wanna be pro tore the place apart. The waves seemed better outside the contest zone and then this morning swings around the proper start to the event and it was tiny.....clean....but tiny. Always the way. Well, the S'ly groundswell is being picked up by some of the buoys but it's pretty faint.